One situation that you should never have to worry about is whether or not your travel documents are in order before that big trip abroad. 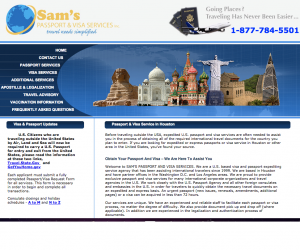 If you are getting ready to take that big international flight or go on a cruise and suddenly realize that you don’t have your passport or visa, Sam’s Passport is here to help. Sam’s Passport will submit all of the necessary documents and processing fees on your behalf, cutting the standard three to six week processing time down to one to two business days depending on a few different characteristics. They’re a trusted and valued team of professionals that will make sure that you don’t have a thing to worry about so you can enjoy your trip in peace.